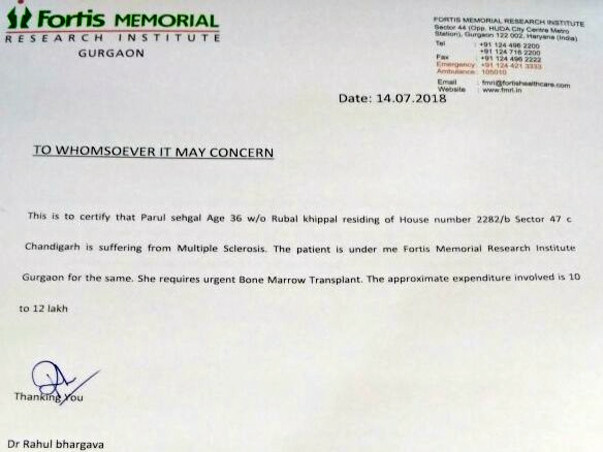 Help Parul Fighting With Mutiple Schlerosis. I was 28 working as a Manager with a reputed insurance company. I was on top of my career, life was good. I was young, full of life, living it to the fullest. In May 2010, one day I felt a tingling sensation on the left side of my body. I did not bother much, thought it might be due to weakness, stress or sitting long hours in front of the computer. When the problem persisted, I decided to visit a Doctor for a general consultation. I was told by the doctor to consult a Neurologist who asked me to get a Brain MRI done. After the MRI, I got the reports and re-visited the neurologist. After seeing my reports, he asked me to come again the other day with my parents. The next day the doctor asked my parents to get me admitted to the hospital. In June 2010 I was diagnosed with Multiple Sclerosis, it left me shattered. Finding out that this disease does not have a cure ended my world,my dreams,my desire to live. I was admitted, lumber puncture and other tests were done. I was given steroids. I was discharged after 5 days. The tingling sensation went away but it was taken over by intense weakness. I could not walk properly. That was my first attack. Multiple Sclerosis is an autoimmune disease in which the immune system attacks the brain and spinal cord and eats away the protective covering of nerves. This nerve damage disrupts communication between brain and the body. MS causes different symptoms including vision loss,pain,fatigue,impaired coordination, muscle paralysis,muscle weakness,problems with coordination,slurred speech,overactive reflexes,difficulty in walking,heavy legs,numbness of face and tongue. In 2012, I got the second attack, this time on my right side. After hospitalisation and steroids infusion I was discharged. This time it was my right hand that got affected. Only 40-45% sensation was there is my hand. I could not write. My hand would shiver if I carried something. Married in 2013, I am having a loving and caring husband who has accepted me the way I am despite of knowing the effects of this disease. I have a supporting family. Every morning i get up and thank god that even though I am bruised, I can stand. In 2016, I found out that this disease started attacking my Spinal cord too. Somehow I gathered myself thinking I cannot give up on life and will fight back. The irony is that in a chronic disease like Multiple Sclerosis, people will come and tell you - Oh!! You don't look sick. A person may look absolutely normal from the outside but from the inside she maybe going through hell. People have a mindset that if you are sick, you should be on bed. Presently I am having problems in walking, my left leg is still numb. I have to drag it as I cannot lift it properly. I cannot climb stairs, my mobility is hampered. I have lost my ability to write, I am facing balance and co-ordination problems. I sometimes get double/blurred vision. My other problems include muscle stiffness, bladder issues, never ending pain and cramps. Last year I found out about a procedure called Hematopoietic Stem Cell Transplant which can completely halt the progression of the disease. In this treatment hematopoietic (blood cell-producing) stem cells, which are derived from a person’s own bone marrow,are collected and stored,and the rest of the individual’s immune cells are depleted by chemotherapy. Then the stored hematopoietic stem cells are reintroduced to the body. The new stem cells migrate to the bone marrow and over time produce new white blood cells. 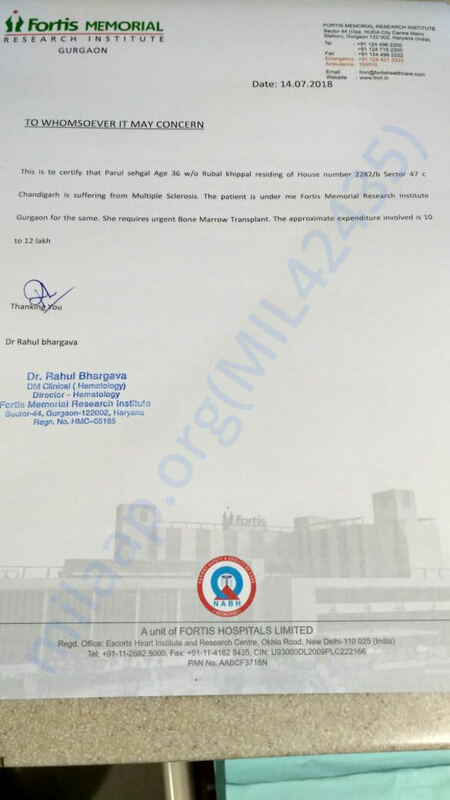 The cost of the transplant in India is 15-20 lacs including hospitalisation, tests, treatment and isolation period of 60 days. It can go higher in case the patient gets shifted to ICU if he/she catches any infection during the period when the immune system is completely depleted. 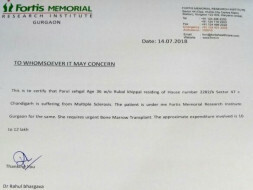 Presently, Fortis, Gurugram is carrying this treatment under Dr. Rahul Bhargava. This procedure will halt the progression of the disease though it cannot completely cure it. In some cases the damage caused by the disease has been reversed. I can’t let myself go on a wheelchair, become bedridden and die without even trying. Please contribute, every bit counts.! !